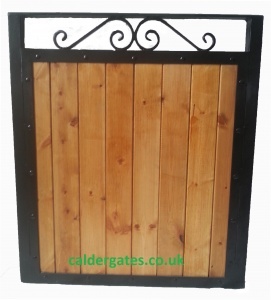 This is our stunning metal framed/ wood infill Sherwood garden gate. 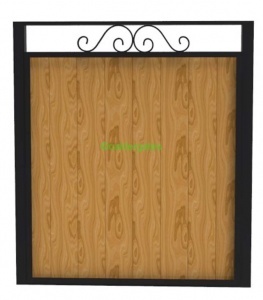 The wood is inserted into the gate frame and is easily removable when needed to be replaced. 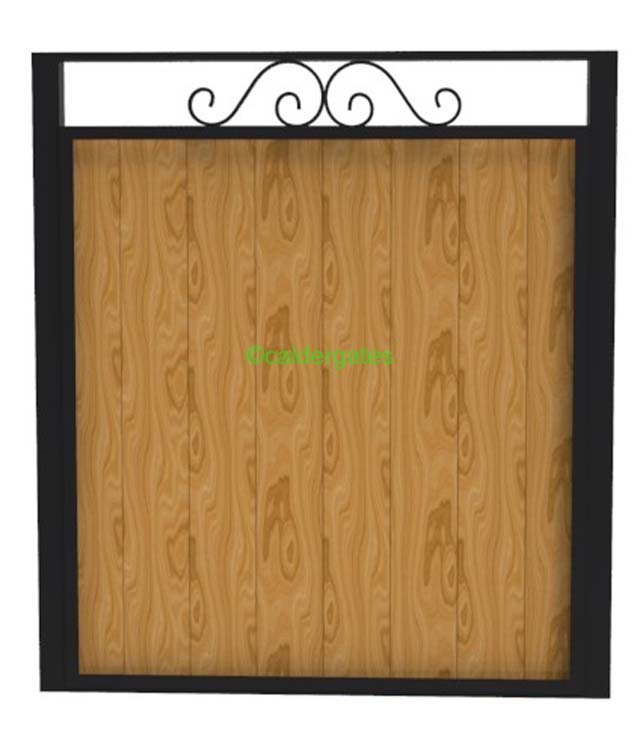 This is a great alternative to a completely wooden gate as it still gives the privacy but will not twist or sag like a traditional wooden gate due to the strong metal frame . FREE TOPCOAT OF PAINT!!. 25x5mm flat bar inner frame. 90mm wide x 19mm thick wood. Wood is coated with 2 coats of wood preserver and 1 coat of medium oak stain. Black primed and free semi gloss black topcoat with a galvanising option to prevent rust. Supplied with adjustable hinges and fixing bolts. The Widths listed is the gap you have between your walls or posts, we then work out of the size of the gate. If you need gate posts, remember to allow space for these. Don't forget to allow for ground clearance too - typically 60mm. 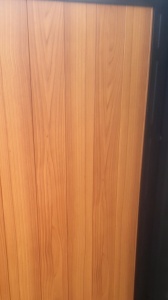 We offer you a choice of finish on all our gates. Hot dipped galvanising is the best possible way to rust proof metal work and can last up to 100 years depending on where in the UK you are. Please click here to see your areas corrosion rate here. 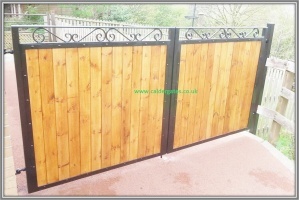 We recommend that you do galvanise your gate so that you can enjoy our gates for many decades to come. Knotwood aluminium infill alternative for steel framed gates. We are now offering a Knotwood aluminium wood alternative to our standard pressure treated wood infill on our gates. Knotwood is a wood grain effect aluminium, it has the same look of wood without the maintenance - No swelling or warping, no fading, no splitting and no rusting. It has been developed in and manufactured for the harsh conditions of Australia and is supplied with a 10 year manufacturers warranty. Knotwood boasts the low maintenance and high durability qualities of aluminium, in addition to the natural beauty and warm textured feel of wood. Put your mind at ease knowing that Knotwood is the highest quality wood grain finish available. Please be aware that Knotwood contains natural colour variation consistent with that of real wood. 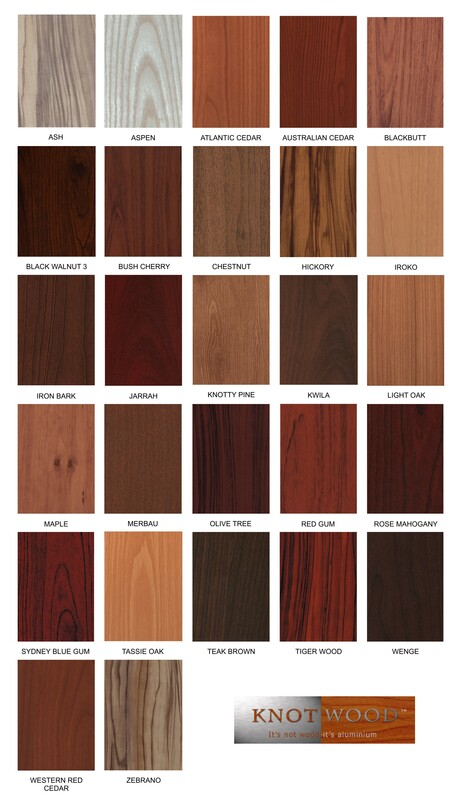 Our standard Knotwood finish is Light Oak, although we are usually able to source any of the finishes on the chart below. The material thickness we use us a 100mm wide x 16mm thick hollow section.